December 2009 - the Swallow SS100 replicar is again available, visit our other web site through this link HERE to view more details. Wind in the Hair Motoring Treat Yourself - Build a Swallow 100! It Takes Sheer Imagination To Create a Car Iike The 'SWALLOW 100"
At ASC we always have a total commitment to building and designing cars with imagination. The world's greatest showman, Barnum of Barnum 8 Bailey fame once said: "imagination is the spice of life and the seed of greatness." Four years ago, "Swallow 100" was a dream. We dreamed of creating the most beautiful car in the world. One that would capture the imagination and steal the hearts of all who saw it. One that would embody the collective and talent of our engineers and designers. So began a painstaking and relentless pursuit to create the entirely hand-made precision- built "Swallow 100". It was a commitment to time, to detail and to a dream. The result was the magnificent "Swallow 100". The most beautiful car in the world. The "Swallow 100" Combines Nostalgia with Technology. The "Swallow 100" is a new statement of pride. Pride of development, pride of manufacture, pride of uniqueness and ultimately pride of ownership. The "Swallow 100" will entice you for reasons that delight the mind and please the eye. Emotions are stirred by the combination of yesterday's past and tomorrow's future. Our dedicated and highly skilled tradesmen, have been assembling fine motor vehicles for over 11 years and are continually striving for excellence and perfection. Underneath each "Swallow 100" are generations of automotive practicality. What's more beneath the spectacular finish of high gloss curves is the work day reality of a standard motorcar. 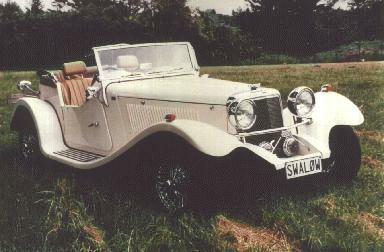 Unlike most modern cars the "Swallow 100" has its own structural steel frame and chassis. Our componentry is chosen on efficacy first, and price second. The Swallow has used the attractive appearance of the 1937 Jaguar SS100 sports car as its base. To allow comfort and safety in the 1990s driving arena several subtle changes have been made, but none which compromise the overall beauty of the SS100. The Swallow sports car is constructed on a professionally engineered and built ladder frame chassis using box section steel 100mm X 50mm as its main members. The strength of this chassis will withstand the strain of todays motoring and, while appearing to be overdesigned, offers passengers both comfort and safety. Side intrusion doors are standard items. Only one of these cars will be built per year, built to the customers specifications on paint and upholstery colours. For overseas markets the car will be available built to stage one. That is, we will ship the car fully painted and upholstered but without motor, suspension, wheels, and instruments. This is because most of those parts are imported into NZ from the USA and there seems little point in the customer paying for additional costs, freight etc. Part numbers and supplier list is provided for customers so they can order direct if chosen. The front brake rotors, calipers, differential, and all bracketry are supplied. Stage 2 is also available, “motor minus” if required. Front suspension is fully independent Mazda Miata MX5 NB but with 11” rotors and Subaru 2 pot calipers. Rear suspension is fully independent Mazda Miata MX5 NB but with General Motors limited slip diff. (3.45) and axles. Motor and gearbox is General Motors Chevrolet LS1 5.7 litre V8, Auto only. Also Holden. Available as Left Hand Drive or Right Hand Drive. Wheels are Dayton stainless steel spoke 16” X 6”. Seats are Mazda Miata MX5 and are not supplied but sufficient covering material is so that they can be upholstered locally. Instruments are “Classic” type in various colours. Speedo, Tacho, Oil, Volts, Fuel, Water temp, Clock. Fuel system is custom aluminium tank with General Motors (Holden VT) pump and swirl pot. New fuel lines and filters. New radiator. Body, grill is all chrome on brass hand crafted with stainless mesh and solid brass cap. Bonnet, all 1.2mm electro galvanised steel with genuine louvres and stainless steel hinge. Push button catches. Doors Fibreglass with side intrusion protection. Stainless steel burst resistant hinges, double action burst resistant catches. General, fibreglass gel coat. Coremat is added to give stone protection in mudguard areas. 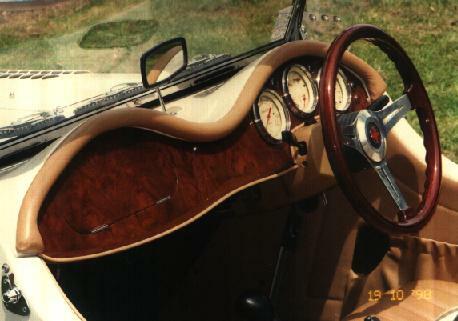 Interior, Dashboard. Burr Walnut with flocked glovebox. Impact crash strip installed on top of dash area. Quality cut pile Carpet. 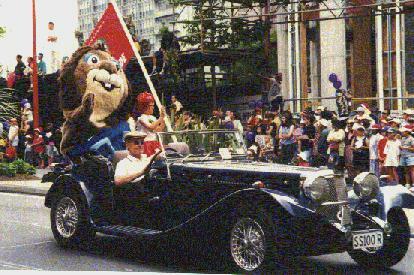 Soft top is “Stayfast”, similar to that used on BMW, Mercedes, etc. with zippered sidescreens and stainless steel soft top fittings,.